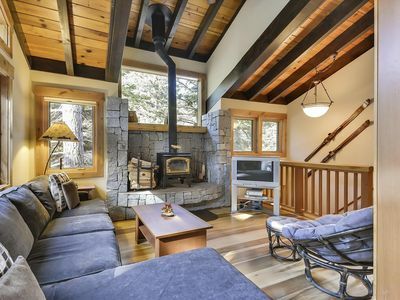 This 3-bedroom condo is located in the most scenic, quiet cut-de-sac of Lake Forest Glen, and has a large deck that steps right onto a gorgeous, open meadow. 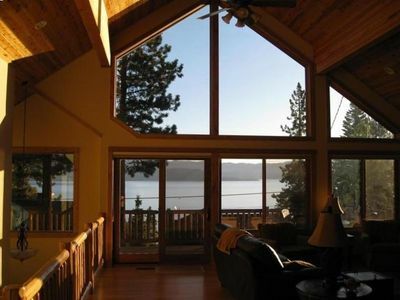 It is near charming and beautiful Tahoe City. 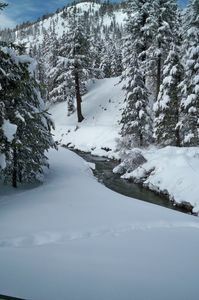 It's close to skiing, and just a short walk to the lake with a quiet, public beach. 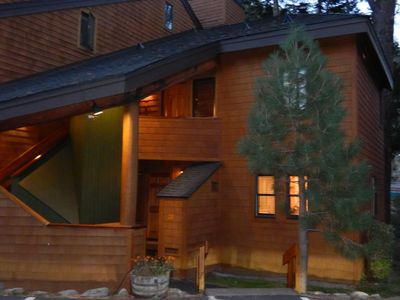 This beautiful location is perfect for families, recreation-seekers or even for a couple's getaway. Lots of kid-friendly extras are available for your use as well, if you like. Located right on LFG's western meadow for sunset-viewing & stargazing, this unit has lots of family amenities including an open-plan kitchen with lots of counter space for cooking, full dining/gaming area for 6+, 1.5 updated bathrooms, including a large walk-in glass shower. 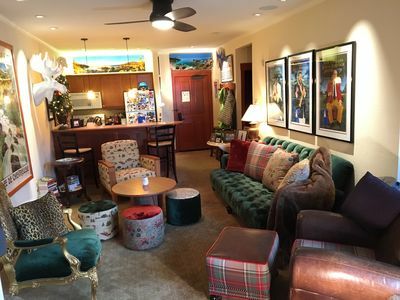 Living area has plenty of comfortable seating, newer gas fireplace, large flatscreen TV with cable, Roku to log into your Netflix account, and substantial DVD library. 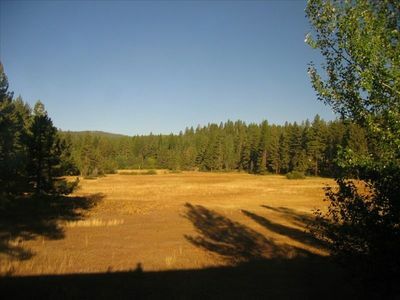 Room 1 is very large with a California King log bed, large closet with additional vanity/mirror area and offers gorgeous view of the expansive meadow. Room 2 has a comfortable log Queen bed, Room 3 has two comfortable log Twin beds. Pack-N-Plays, booster chairs, bed rails, etc. available for our littlest guests. 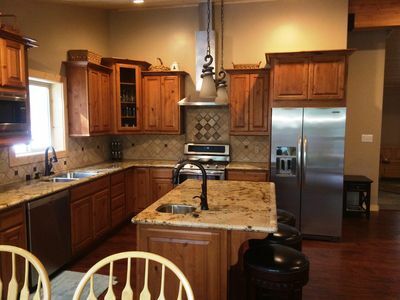 Wireless internet access throughout. Walk right in to unit - no steep, slippery stairs to climb! Parking in regularly plowed area for 2 large cars. Stone entry with bench & closet space to store wet shoes & coats, also has outdoor toys, beach chairs, etc. for use. 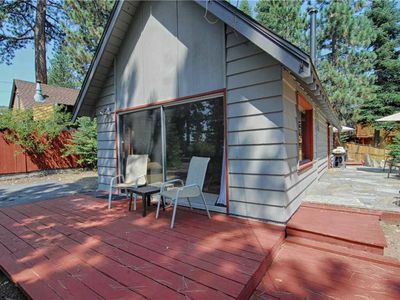 Large, sunny back deck on floor level has 6 Adirondack chairs to relax on while enjoying the fresh air, the sounds of the trees and the gorgeous, expansive meadow view. Propane gas BBQ, umbrella & chairs on deck in warmer months. Storage tucked away under the interior stairs contains loads of toys/activities and games for all ages. The condo has double-pane, east/west facing windows with blackout curtains in the east bedrooms to stay cooler in the heat of the summer days - the sunny deck with large umbrella awaits when you want some afternoon sun. Newer gas fireplace, forced heat with Nest thermostat, and expansive, west-facing views from master bedroom, kitchen and dining room offer lots of natural beauty to enjoy all year round, whether you are inside or out. Open-plan, cook's kitchen is fully equipped with generous counter space, dishwasher, gas stove/oven, large built-in microwave, pots, pans & loads of dinnerware, spice rack, toaster oven, electric kettle, coffee maker, coffee grinder, blender, large refrigerator and full-size washer/dryer in adjacent laundry area. The carpets are professionally steam-cleaned annually, and no pets or smoking is ever allowed. Enjoy all the comfort & amenities of our home away from home! The condo complex has two swimming pools ('quiet' pool & 'family' pool both open Memorial Day to Labor Day), four tennis courts, outdoor hot tub open year round, dry sauna, playground structure, basketball hoops, and regular snow-plow service. Our unit is located on a quiet cul-de-sac close to the pools, but not within ear-shot of the daytime activity there. The street, Glen Strath, is away from the higher-traffic entrances, basketball courts and main circle roads. You won't have groups passing by on their way in/out, to the pool or lake. We also have a local property manager that can assist you with last-minute emergencies. 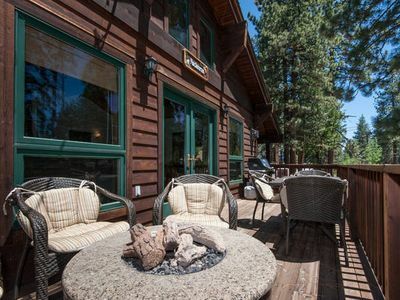 This home is conveniently situated 1 mile from Tahoe City for upscale & casual restaurants, bars/brewery, Safeway & SaveMart grocery stores, CVS drugstore, movie theater, golf course, shopping, yogurt & ice cream, coffee, ski and bike rental shops, hardware store for fishing supplies. 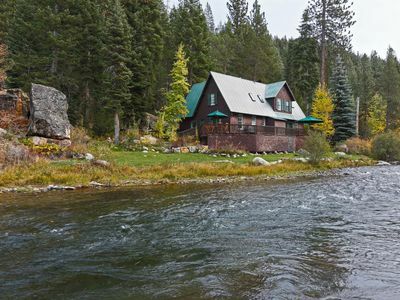 Also, near sledding and cross-country skiing in winter, boat launch, Truckee river-rafting in summer, yoga, massage, summer farmer's market & outdoor movies at Commons Beach, and Tahoe’s famous 'Fanny Bridge', Watson Cabin, & Gatekeepers Museum. Bike paths are very good on the North Shore, especially to-and-from Tahoe City!! 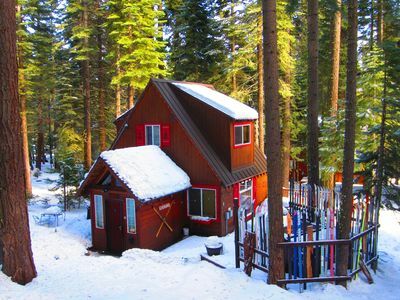 Alpine Meadows, Homewood and Squaw Valley Ski resorts are just 6-10 miles away for skiing, ice skating, indoor rock-climbing, horseback riding, cable car ride, snow tubing, ski schools. 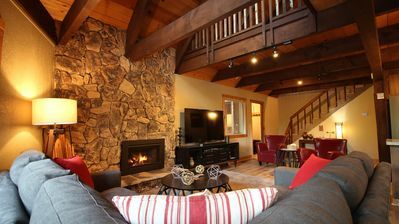 Agatam Retreat - Hot Tub, Fireplace & Gourmet Kitchen - Easy Walk to Beach!! 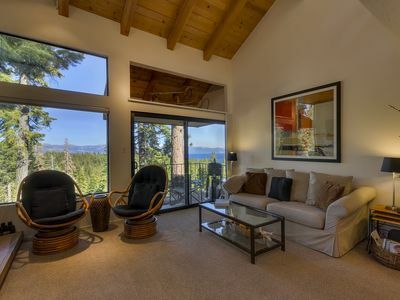 Luxury home with panoramic Lake Tahoe View; sleeps 12!